| Today, a radio broadcast is the same for everyone. That could change with the object-based audio solutions developed by EU research project ORPHEUS, which has the potential to revolutionise the listener experience. The radio broadcasts of tomorrow could be interactive, personalised and immersive. For the first time, ORPHEUS will present its prototype solutions for the audio content of the future at IBC 2017 in Amsterdam on 14 to 19 September. 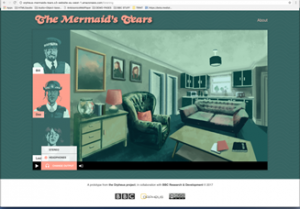 In July, ORPHEUS produced a pilot radio drama called “The Mermaid’s Tears” at the BBC in London, in order to demonstrate the project’s object-based solutions. Through an app or a web browser, the listener can choose to follow any one of three characters, who move between different rooms. Depending on the listener’s choice, the story will unfold from a different perspective compared to other listeners who made different choices. In addition, the listening experience is enhanced by immersive 3D sound, which is like being in the room with the characters, and by images that are triggered at different times. By using object-based technology, which separates audio content from meta-data describing this content, the production and distribution of such immersive broadcasts becomes much easier and cost-effective. For listeners it means they get the best experience possible, whether they listen via an iPhone app on their mobile phone (see screenshot), via the browser on a PC, or via an AV receiver on a hi-fi system in the living room. The BBC radio drama is just one example of the many ways in which personalised and immersive audio broadcasts can be created with the ORPHEUS solutions. 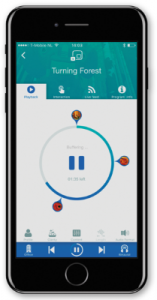 Other examples produced in the ORPHEUS pilot include a football match report with immersive audio, commentary enhancement and transcript (BR) and a soundscape with immersive audio, commentary enhancement, transcript and individually adjustable audio objects (Fraunhofer IIS). In order to enable such novel audio experiences, ORPHEUS is developing, implementing and validating a new end-to-end object-based media chain for audio content. For this IP-based chain, ORPHEUS is using international standards, including ADM (Audio Definition Model for metadata), BW64 (Broadcast Wave including audio essence and metadata), MPEG-H 3D Audio (ISO/IEC audio codec with all necessary interactive and immersive features), and MPEG-DASH (for adaptive streaming). ORPHEUS will demonstrate selected results of its first pilot at the IBC exhibition, specifically at the booths of Fraunhofer IIS, BBC Research & Development, and b<>com. Courtesy of the European Broadcasting Union (EBU), we will also be able to showcase our work at their central booth in hall 10. ORPHEUS is a European research project under Horizon 2020 dedicated to improving the management of audio content. The consortium consists of 10 partners from 4 countries: Fraunhofer IIS (DE – coordinator), Eurescom (DE), BBC (UK), IRT (DE), Elephantcandy (NL), Trinnov (FR), b<>com (FR), IRCAM (FR), BR (DE), Magix (DE). The content of this press release is owned by the ORPHEUS project consortium. The European Commission has no responsibility for the content. This press release may contain forward-looking statements relating to advanced information and communication technologies. The ORPHEUS project consortium does not accept any responsibility or liability for any use made of the information provided in this press release.